From the classroom to the courtroom to the boardroom to your kid’s room, each of us can be more persuasive. Whether we’re coaching on the ball field or witnessing on the mission field, the principles are essentially the same. But few of us have been taught the art and science of persuasion. How do we get someone to say yes who may be inclined to say no? Drawing from the timeless lessons of the world’s greatest influencer, Jesus Christ, here are fifteen ways to open people’s eyes and change their minds, even when they’re highly-resistant to change. You can do more than make a argument. You can make a difference. Learn how through this study. Si lo han llamado a ser una persona de influencia en el hogar, en el trabajo, en la escuela o en cualquier otro lugar, usted puede hacer más que presentar un argumento, puede influir a otros. 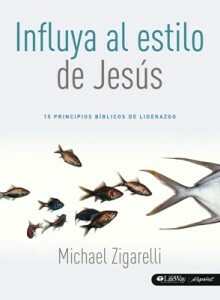 De las lecciones eternas del influyente más grande del mundo: Cristo Jesús, el doctor Michael Zigarelli extrajo 15 maneras positivas para abrir los ojos de las personas y cambiar sus mentes, aunque estén altamente opuestas al cambio. Venga y explore los muchos principios bíblicos de persuasión.